What’s your shoe size? Are your feet the same size as your mom’s feet? How about your sister’s feet? Can you borrow shoes from each other? Post a picture of your latest shoe buy. Tag the number of women of your shoe size, i.e. size 5 = tag 5 friends. Don’t forget to drop a line in this blog when you’re done. But I did by something similar lately from Celine. Oh yeah, so comfy & chic. I am tagging Vanessa, Nikki and Gracie. Van, just the other day i wanted to buy gladiator shoes at Bakers kaso lang $40 pa man gud…hulat hulaton mobaba basin diay kaabot og 20,hehehe! that flats u got is soo cute! thanks for doing this! i like your new pair! 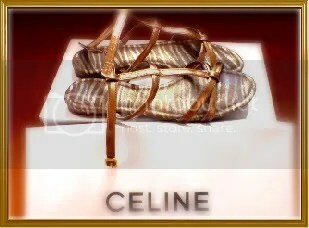 you just don’t know how much i miss Celine…pati na rin Janylin. haaayy! !